Investing in silver bars is not very attractive for individuals. In contrast to gold, silver is considered an industrial product and are therefore taxed with 21% VAT. This makes silver bars in particular a less attractive option for private investors because they can't get a VAT refund. Tax-free silver is a unique opportunity offered by AmsterdamGold in partnership with AmsterdamSafe. Tax-free silver offers a way for individuals wanting to invest in silver without the disadvantage of 21% VAT to do so. Your tax-free silver is delivered from outside the EU in a heavily protected bonded warehouse where your silver is not taxed with VAT. Explanation and information about tax-free silver. How is tax-free silver possible? Silver, unlike gold is viewed as an industrial product and not as an investment product. Where as the margin-ruling can be applied to silver coins, silver bars are by definition taxed at 21%. Since only businesses can get a tax return on their purchases, purchasing taxed silver is not attractive for individuals. All goods including silver imported from outside the EU come under the Dutch governments sales tax law. However, as long as the goods are not traded, the 21% VAT tax will not be levied. 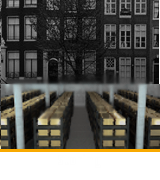 AmsterdamSafe is an organization that is focused on insured and maximum security storage of physical precious metals. The storage facilities of AmsterdamSafe are located at Schiphol Airport within an area controled by the Koninklijke Marechaussee (Royal Military). Along with the extra security offered by the location there is another advantage: AmsterdamSafe has access to the bonded warehouse of AmsterdamGold to store physical silver. In conjunction with AmsterdamSafe we offer the unique possibility to import your silver purchase from outside the EU and store it in the bonded warehouse under your name. Your tax-free silver is supplied by a LBMA accredited provider with a Good Delivery Status. It is brought from outside the EU directly into the customs warehouse. In this manner, the silver is not taxed. Only when the silver leaves the bonded warehouse will it become taxable and subject to import fees. If you choose to take advantage of our buy-back guarantee, you can avoid paying VAT tax upon selling as well. You purchase will be tax-free as long as it is stored in the bonded warehouse. When you decide you want to remove the silver from the warehouse - you will be taxed 21% on the actual value of the silver at that moment in combination with steep import fees. To help you avoid this taxation and these fees, your purchase comes with the guarantee that as long as the silver has not left the bonded warehouse, we will purchase it back from you at a minimum rate of 98% of the spot price of the tax-free silver. In this manner your tax-free silver will not leave the bonded warehouse and will not be taxed. Amsterdam Safe negotiates an all inclusive storage price for just 1,25 percent per year (excluding VAT but including insurance) of the replacement value of your tax-free silver. The replacement value will be syncronised with the current replacement value on the first day of every quarter. The replacement value is the value against which your silver is all risk insured. Additionally, any fluctuations in the replacement value during the quarter are also all risk insured by AmsterdamSafe which means your silver is always 100% insured. 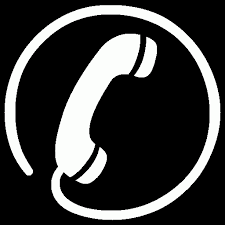 The insurer calculates the replacement value based on the value including VAT. The following is an explanatory example. The silver bars are stored excluding VAT, however in calculating the replacement value 21% VAT is included. Therefore the storage fee that you pay is based on the actual replacement value plus VAT. The storage fee is calculated based on the replacement value (including VAT). This is the same amount for which your silver is all risk insured. Additionallly, you pay a per-entry/exit fee of € 35,00 excluding VAT. Decided you want to turn your tax-free silver into physical silver? 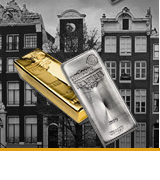 You can choose to sell your silver back to Amsterdamgold instead of importing it. You can use the money to purchase silver coins. We offer a transitioning service for this. Contact us for more information! 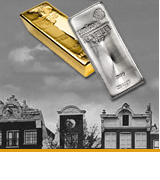 100 troy ounce silver bar delivered in the bonded warehouse of AmsterdamSafe. This product was added to the assortment of AmsterdamGold with the purpose to make VAT free silver more accessible.